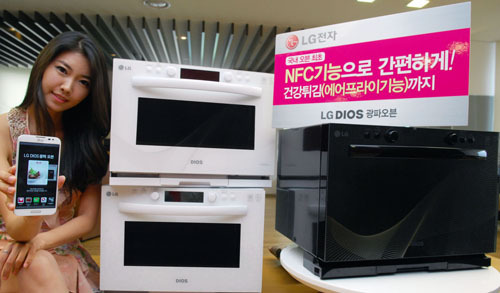 LG microwave nfc Let's use the NFC in our phones to ... cook lunch? Let's use the NFC in our phones to ... cook lunch? It's no secret that I love NFC. Well, LG wants to use it as a means of communicating to your microwave. The Korean Newsroom page for LG unveiled the LG Wave Oven DIOS. Which has an app for your phone. Tap the phone do your device (presumably that way the NFC then sets up BT or WIFI communication with the oven) and then you tell it how to cook whatever's in there. Maybe I just haven't had a microwave in a while... but were they that complicated before? I'm usually all for some cool tech, but this might be a bit much. Then again, given the multitude of things you can do with a microwave these days, who knows what new doors this might open up?